Star striker Cristiano Ronaldo declared himself fit on Sunday and ready to play in Portugal’s World Cup opener against Germany. Ronaldo said he had recovered from a left-knee injury that has bothered him recently. “I would be the first to tell the coach if I were unable to play, I would never put my career at risk even for a World Cup,” Ronaldo said as he prepared for Tuesday’s match in Group G in Salvador, Brazil. “I’d love to be 110 percent and but I am 100 percent and that is enough to help my team,” the Real Madrid striker said. The Portugal forward and FIFA player of the year was seen earlier this week walking away from training with ice bags on his knee. He wore a bandage on the knee during Sunday’s practice at the match venue, the Arena Fonte Nova. France and Honduras streamed onto the pitch in Porto Alegre, Brazil, greeted by a massive roar. But as players took their positions, it become clear something had been left out: the traditional singing of the national anthems. The Group E match kicked off at Estadio Beira-Rio in Porto Alegre on Sunday without the anthems being played over the stadium speakers. FIFA said after the match it was “very sorry” that that the audio system didn’t function. Karim Benzema scored twice and created a third that was confirmed by goal-line technology as France eased into its World Cup campaign with a 3-0 victory over Honduras on Sunday in Porto Alegre, Brazil. The convincing victory – albeit against a 10-man team for more than 45 minutes – was in stark contrast to the team’s performances in South Africa four years ago, when the highly paid squad failed to win a single match and was sent home in a disgrace after going on a training strike. It now tops Group E and, with Switzerland and Ecuador left to play, stands a good chance of staying there. Benzema’s first goal came from the penalty spot just before halftime after Wilson Palacios was sent off with his second yellow card for charging into the back of Paul Pogba. The Real Madrid striker calmly slotted the ball to the left of Noel Valladares to give the French a deserved lead going into the break. With Honduras down to 10 men, France didn’t take long to double the score, thanks again to the Real Madrid striker and the first decisive use of goal line technology in a World Cup. Yohan Cabaye, whose pass had earlier picked out Pogba to give the French their penalty, struck a long ball that Benzema shot across the goal. The ball came back off the post across goal before Valladares fumbled it over his own line. With the new technology system confirming the ball crossed the line, referee Sandro Ricci gave the own goal despite Honduran protests. Benzema got his second on the 72nd minute, firing in powerfully from inside the area after a long-range shot by right back Mathieu Debuchy was blocked. Les Bleus, featuring just five holdovers from 2010, dominated from the opening whistle against a Honduran team seeking its first World Cup win. The Central Americans had a reputation for aggressive play going into the match, and their 14 fouls and one expulsion will only add to that. The Hondurans’ physical approach succeeded in stifling some of the approach play of the French, but the 1998 champions looked especially dangerous down both flanks in the first half hour. Blaise Matuidi connected with a cross but saw his header tipped onto the bar by Noel Valladares, while Antoine Griezmann, playing in place of the injured Franck Ribery, also rattled the woodwork after climbing high in the six-yard box. Argentina 2, Bosnia 1: Lionel Messi scored a stunning second-half goal to push staggering Argentina to a victory over Bosnia at the Maracana in the Group F opener in Rio de Janeiro. Messi lifted Argentina in the 65th minute, moving in from the right and striking a low left-footed shot off the inside of the post behind Bosnian keeper Asmir Begovic. It was Messi’s second World Cup goal, adding to one he scored eight years ago in Germany. Vedad Ibisevic scored a close-in goal in the 85th to give Bosnia hope. 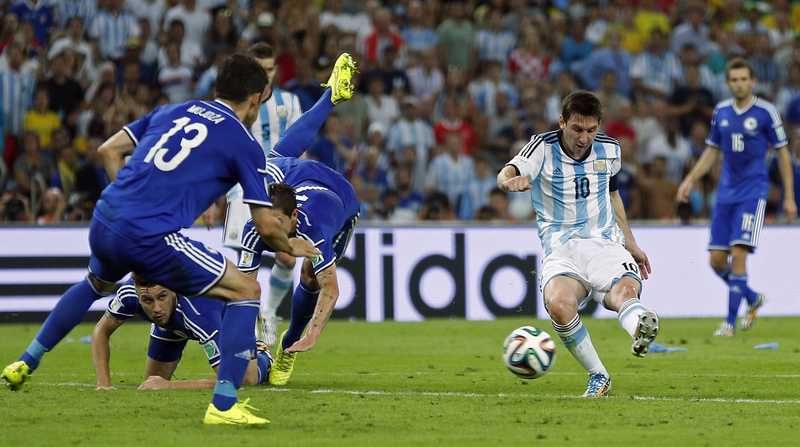 Argentina took a 1-0 lead in the third minute on an own-goal by defender Sead Kolasinac. For the remainder of the half, Argentina showed little with Messi seldom touching the ball and Bosnia – a World Cup debutant – looking more threatening. Switzerland 2, Ecuador 1: A goal deep in stoppage-time by Haris Seferovic gave Switzerland a dramatic victory over Ecuador in their Group E opener in Brasilia. In a match that looked destined to end in a draw, substitute Seferovic fired home the winner in the closing seconds. Enner Valencia had given Ecuador the lead in the 22nd minute at Estadio Nacional in the Brazilian capital. Switzerland’s equalizer followed in the 48th, with Admir Mehmedi heading home from close range.